This Chart Shows You How To Win On Jeopardy! The best part about watching Jeopardy! at home is playing along to see if you can beat whichever contests happen to have shown up that day. But could you really win? This chart games out the best strategy for you to do so. The chart is the work of Nathan Yau over FlowingData. 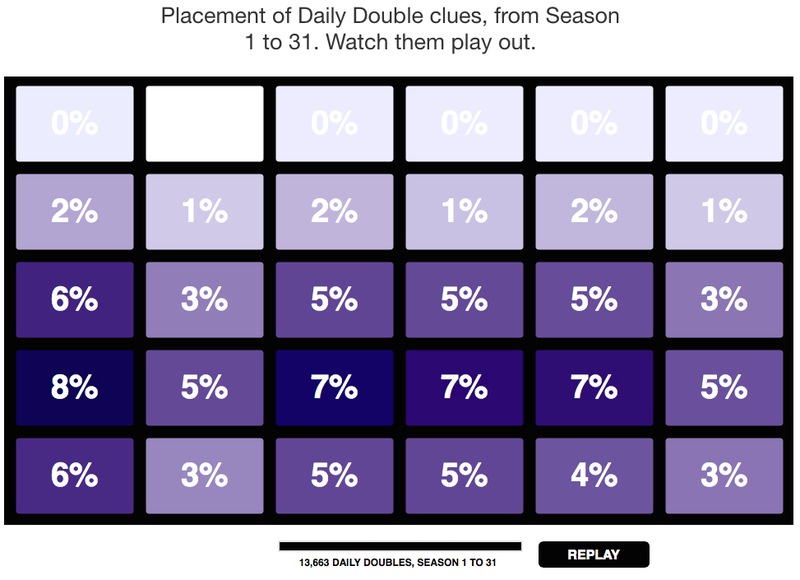 Yau looked at daily doubles placement across all 31 seasons that the show has been running, including over 13,000 of the double-value tiles to see if there was any commonality as to where they ended up. Unsurprisingly, the low value tiles at the top of the board seldom, if ever, are daily doubles. But the highest number of doubles are not all at the highest value questions either. It turns out that, for the smart game player, the best strategy may be to go for the 2nd to largest value questions.